The measurement of coherent elastic neutrino-nucleus scattering (CEvNS) has been a “holy grail” in low-energy neutrino physics since its prediction almost 40 years ago. The scattering process is analogous to the coherent forward scattering of photons on atoms. This elastic scattering proceeds via the neutral weak current and benefits from a coherent enhancement to the cross-section. The enhancement, a purely quantum mechanical effect, is approximately proportional to the square of the number neutrons in the nucleus. The full coherence condition, when the wavelength of the scattering is longer than the size of the nucleus, is guaranteed for nearly all nuclear targets when neutrino energies are <10’s of MeV. Such neutrinos are produced in copious amounts at nuclear power reactors; a fact which suggests that a deployment to a reactor is an ideal location for such a search. Neutrinos with slightly higher energies (>10’s of MeV) are also available at stopped-pion beams, a background-suppressing pulsed neutrino source like the Spallation Neutron Source (SNS) at Oak Ridge National Laboratory. In supernova dynamics, it is the coherent neutrino scattering process which has the largest cross-section, helping to expel material outward. As such, it should be measured in order to validate astrophysical models. A large enough detector can be used to efficiently detect neutrinos of all species from a nearby supernova, allowing a determination of the oscillation pattern and thus the total energy and temperature of the event. Also, a number of experimental searches for physics beyond the standard model can be performed with a coherent neutrino scattering detector. A flavor blind detector (10’s of kg) operated at the SNS can perform searches for sterile neutrinos, provide a sensitive test of the weak nuclear charge and search for supersymmetric extensions to the standard model. 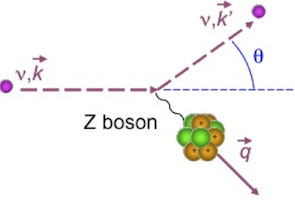 Detectors that incorporate several target nuclei can probe the effect of non-standard neutrino interactions such as flavor-changing or non-universal neutral-current scattering. The CEvNS cross-section is also highly sensitive to the neutrino magnetic moment. An experiment located at a stopped pion beam, such as COHERENT at the SNS, can access neutrinos with slightly higher energies for which the coherence condition begins to break down. Such an experiment would then be able to probe the neutron structure of the target nuclei using neutrinos. To date, the inability to measure the CEvNS cross-section, for which the signature is typically a sub-keV nuclear recoil, can be attributed to the scarcity of available technology. What is needed is a detector with a large enough mass (>1 kg), low enough backgrounds and a low enough threshold (<1 keV). Recent developments in WIMP detection technology have enabled this.